Transfer pricing has become one of the most important and sometimes most controversial elements in performance measurement. The internal transfer of goods or services can impact positively or negatively on the performance measures used for responsibility centers just the same as the external transfer of goods and services. It should be obvious that a conflict is likely to arise in an organization between responsibility center managers because the “buyer” wants the transfer price to be as low as possible while the “seller” wants the transfer price to be as high as possible. When an exchange of goods or services takes place between a responsibility center and an external party, the forces of demand and supply according to the microeconomic rules of the marketplace determine the price that the buyer is to pay and the seller is to receive if the transaction is to be consummated. What transfer price should be set so that buying and selling responsibility centers, acting in their own best interests, will at the same time act in the best interests of the company as a whole? This is a serious question because suboptimal decision making will result if either (1) the buying responsibility center manager goes to an outside supplier to satisfy his needs when he should have gone to the selling responsibility center manager or (2) the buying responsibility center manager goes to the selling responsibility center manager to satisfy his needs when he should have gone to an outside supplier. Upper-level management may insist that the buying and selling responsibility centers, although they are theoretically autonomous units, always take only those actions that are in the best interests of the company as a whole; undesirable behavioral consequences are likely to result from pseudo-decentralization. How Important Is The Transfer Pricing Issue? A 2005 survey by the accounting firm Ernst & Young involving 108 financial institutions from Australia, Canada, Continental Europe, Hong Kong, Japan, Singapore, South Africa, United kingdom, and the United States concluded that “transfer pricing is rated the most important international tax issue facing multinationals” [“transfer Pricing organizations, audits and Priorities in the Financial services industry” [Source]. More than half of the participants in the survey indicated that they now set aside a provision for transfer pricing risk in their financial statements. 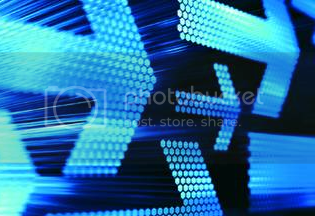 The choice of a transfer pricing method for cost centers is limited, of necessity, to cost. However, if the actual costs of production departments or service departments are used, their managers will have little if any incentive to control costs. as a consequence, any inefficiencies of the selling cost center are passed along to the buying cost center. A simple solution calls for the use of standard costs in place of actual costs for production departments and service departments. It is the ideal transfer price for cost center exchanges of goods or services. By leaving favorable or unfavorable variances in the selling cost center, the buying cost center will be charged a “fair” transfer price equal to the cost of the goods or services that should have been incurred by the selling cost center. The company as a whole will benefit from the use of standard costs because its selling cost centers will have maximum incentive to control their costs and its buying cost centers will no longer be unfairly penalized by having to pay for the inefficiencies of the selling cost centers. In this post we discuss transfer pricing for profit and investment centers. In accounting for their intra-company transactions, a number of cost-based transfer pricing methods will be examined. Because of the overwhelming advantage of standard costs over actual costs just observed in relation to cost centers, any reference to cost (whether it be variable cost, full cost, or some other cost-based transfer pricing method) will be understood to be standard cost and not actual cost. On my next post, we will look at the issues associated with transfer pricing by multinational corporations. The focus here shifts from performance measurement and evaluation to tax issues. Enjoy! A transfer price is the dollar basis used to quantify the transfer of goods or services from one responsibility center to another. Transfer pricing is an important topic. The explosive growth in most companies as a result of either internal expansion or external mergers has accelerated the trend toward decentralization and intra-company transactions. A transfer price should be thought of as a signal sent to the buying responsibility center to take a predetermined course of action. On the one hand, if the transfer price charged by the selling responsibility center is greater than the outside market price, the transfer price is a signal to the buying responsibility center to buy from an outside supplier. On the other hand, if the transfer price charged by the selling responsibility center is less than or equal to the outside market price, the transfer price is a signal to the buying responsibility center to buy from the selling responsibility center. Many companies today are structured on some variation of vertical integration in which the finished product of one responsibility center becomes the raw material of another responsibility center. For example, in a paper manufacturing company the output of the paper division may be sold to outside customers or may be transferred to other company plants that manufacture paper bags or corrugated boxes. Here the problem of intra-company transfer pricing arises. Several different transfer pricing methods are in use, each with its own advantages and disadvantages which we will discuss on the next section. The transfer pricing method used must be the one most beneficial to the company. Much has been written in the management accounting literature concerning the motivation and the autonomy of profit or investment center managers. Most companies today give careful consideration to these behaviorally oriented factors in establishing responsibility centers and in selecting managers for them. There is a possibility that at times the interests of the responsibility center manager may conflict with the interests of the company as a whole. In such cases upper-level management may act to ensure that the profit or investment center’s interests are made congruent or brought into line with total company interests. Goal congruence. The transfer price that is set should send a signal to both the buying and selling responsibility centers to take whatever action is in their own best interests and, at the same time, is in the best interests of the company as a whole. Motivation. Because motivation is a difficult-to-define phenomenon that drives individuals to accomplish goals, the transfer price should not interfere with the process wherein the buying responsibility center manager rationally strives to minimize his costs and the selling responsibility center manager rationally strives to maximize his revenues. Autonomy. In a decentralized company, the managers of the buying and selling responsibility centers should not be coerced by upper-level management into making an internal transfer. Instead, each responsibility center manager should be free to satisfy his own needs either internally or externally at the best possible price. Performance evaluation. Regardless of whether the buying and selling responsibility centers are cost, profit, or investment centers, the transfer price should not adversely affect the fairness of the performance evaluation process and the incentive plans that are based thereon. Each of the various transfer pricing methods currently in use will be discussed only in relation to profit centers for two reasons: Ffirst, transfer prices impact on profit and investment centers in an identical manner; and second, the discussion will be greatly facilitated by being restricted to a single type of responsibility center, which is based on the following comprehensive illustration. 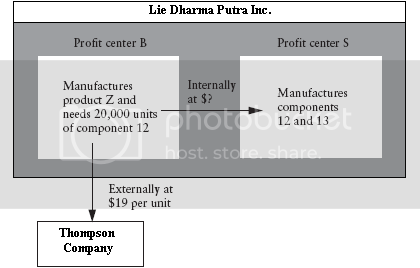 The Lie Dharma Putra Inc has a large number of profit centers, including b (representing the buying profit center) and s (representing the selling profit center). Profit center b needs 20,000 units of component 12. Component 12 is an integral part of product z, which is manufactured in profit center b and sold for $24. Component 12 can be purchased by profit center b either externally at $19 per unit from the Thompson Company or internally from profit center s. in addition to component 12, profit center s regularly manufactures between 80,000 and 100,000 units of component 13, which is sold at a 60% markup on full cost ($21.60 = 160% × $13.50). Component 13 is slightly different from component 12 because of the use of more costly direct materials; so it cannot be substituted for component 12 in the manufacture of product Z. Each of the transfer pricing methods in current use will be discussed from the perspective of the buying profit center, the selling profit center, the company as a whole, and the four interrelated criteria listed above. 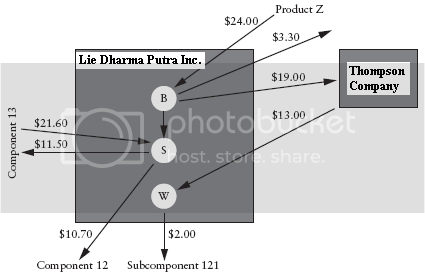 Below figure presents a pictorial representation of the transfer pricing situation that confronts the Lie Dharma Putra Inc; it will enhance the examination of each of the various transfer pricing methods. As already stated with respect to cost centers, where actual variable cost or actual full cost is used, there may not be adequate incentive for the selling profit center to reduce production and/or selling inefficiencies since they can be passed along to the buying profit center. The use of standard costs should help to lessen if not eliminate the problem of transferring variances so that all the examples that follow will be restricted to standard costs. A transfer price set equal to variable cost will lead to goal congruence. That is, the $10.70 per unit transfer price sends a signal to profit center b to buy 20,000 units of component 12 from profit center s instead of from the Thompson Company at $19 per unit. Both profit center B and the company as a whole will have relevant income of $10.00 per unit if the internal transfer takes place. Unfortunately, the motivation and performance evaluation criteria are violated from the viewpoint of profit center S, which realizes no profit at a transfer price of $10.70 per unit. Although no loss would be charged against profit center s in the short run, a failure to cover at least the full costs of $12.70 per unit would result in a long-run loss. if profit center s objects to making the transfer but is forced to do so by upper-level management, then the autonomy criterion would not be satisfied. A transfer price set equal to full costs will still lead to goal congruence. Profit center b will be sent a signal to buy 20,000 units of component 12 from profit center s at $12.70 per unit instead of from the Thompson Company at $19 per unit. With per-unit relevant incomes of $8 and $10, respectively, profit center b and the company as a whole will benefit from the internal transfer. Once again, profit center s does not realize a profit at a transfer price of $12.70 per unit. As a consequence, the criteria of motivation and performance evaluation are still not satisfied. The autonomy criterion would also pose a problem if upper-level management enforced a transfer, assuming profit center s was unwilling to do so. While it might appear at first glance that a full-cost transfer price sends the correct signal to the buying profit center to take an action in its best interests as well as in the best interests of the company as a whole that is certainly not always the case. In this comprehensive illustration, an outside purchase price of $19 per unit was assumed. Suppose the Thompson Company temporarily lowers its price (just for this illustration) to $11.50 per unit. There is no longer a transfer price set equal to full cost that leads to goal congruence. Now the manager of profit center b will be sent an incorrect signal to buy 20,000 units of component 12 from the Thompson Company at $11.50 per unit instead of from profit center s at a full-cost transfer price of $12.70 per unit. As far as profit center B is concerned, there is a $1.25 per unit advantage to buying from the Thompson Company ($12.70 – $11.50). Unfortunately, the company as a whole is penalized $0.80 per unit, the difference between Thompson Company’s outside purchase price of $11.50 per unit and the relevant variable costs of $10.70 per unit to make and sell component 12 in profit center s.
A cost-plus transfer price is used fairly often to overcome the motivation and performance evaluation problems associated with transfer prices set equal to either variable cost or full cost. The cost-plus method is used as an approximation of market price, which was the most popular transfer price reported in surveys of managerial accountants in the late 1970s and early 1980s. Often this is considered a practical approach to the problem of divergent profit center and corporate interests. The base cost used in determining the transfer price varies with different companies. In some cases the profit center manager may want to base transfer prices on variable costs plus profit whereas in other cases that manager may want fixed costs also to be included. Even though the transfer price will be higher than full cost, it may still be in the best interests of the buying responsibility center and the company as a whole to transfer the product within the company. For this to be true in this comprehensive illustration, the cost-plus transfer price would have to be less than the $19 per unit outside purchase price. The buying responsibility center would be sent the signal that would be in the best interests of the company as a whole. 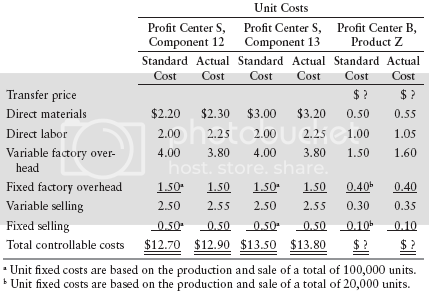 That is, profit center b should buy 20,000 units of component 12 from profit center s. the company as a whole would enjoy an advantage of $8.30 per unit, the difference between the relevant variable costs of $10.70 per unit to make and sell component 12 in profit center s and the outside purchase price of $19 per unit. For illustrative purposes, the cost-plus transfer price will now be set equal to an amount greater than the $19 per unit outside purchase price to demonstrate goal incongruence. A transfer price set equal to full cost plus markup will not lead to goal congruence, at least in the context of this illustration. With an outside price of $ 9 per unit, which is less than the transfer price of $20.32 per unit, the manager of profit center b will be sent an erroneous signal to buy 20,000 units of component 12 from the Thompson Company instead of from profit center s. As a result, the company as a whole is penalized $8.30 per unit, the difference between Thompson Company’s purchase price of $19 per unit and the relevant variable costs of $10.70 per unit to make and sell component 12 in profit center s. With respect to the three remaining criteria—motivation, autonomy, and performance evaluation—a cost-plus transfer price leads to their satisfaction from the perspective of both the buying and the selling profit centers. Any intra-company profit would have to be eliminated, of course, when financial statements are prepared whether it was the result of variable cost plus or full cost-plus transfer pricing. Generally, a negotiated price arrived at between the buying and selling profit centers gives managers the greatest control over profit. As a result, the performance evaluation criterion is most likely to be satisfied, with the autonomy criterion the most likely to be violated if disputes arise. It appears that the negotiated transfer price of $16.51 per unit satisfies all four criteria. However, one of the serious difficulties with this method is that it takes time and a great deal of analysis and data. Also there may be frequent requests for revisions. Possible overemphasis on profit center welfare rather than company welfare may result. Sometimes stalemates may occur and top management has to step in and resolve conflicts. At times ill feeling may develop between managers that more than offsets the benefits gained. Where a competitive market price exists for the output of a profit center, such as the price charged to outside customers, the market price is thought to be the best transfer price. In fact most managerial accountants believe that the outside market price is the most objective measure of the economic value of the good or service being transferred. It is expected, of course, that the market price is one obtained through arm’s-length transactions, on the basis of representative quantities. Generally, internal transfers will be made where the selling profit center’s product is equal to that of outsiders in quality and price. Often a lower price may be justified, since there will be less selling and administrative expenses, larger purchases will be made, and there is virtually a guaranteed market. The buyer also has assurance of continuing good quality and dependable delivery. Certain factors have to be considered in using the market price. There may be no market price for the exact product, or there may not even be a market for an intermediate product such as component 12 in this example. A quoted price must be equal in quality, delivery, credit terms, and so on. In some cases prices obtained may not be reliable; they may be distress prices for excess inventory or defective goods. Another point to consider is that an outside bidder who has consistently lost to internal transfers may possibly make an unreliable or deliberately low bid. it is desirable for the buying profit center to maintain contact with more than one supplier so that a reasonable market price can be obtained. The use of the outside market price appears on the surface to be an ideal transfer price in that it leads to goal congruence, motivation, autonomy, and performance evaluation. However, there are situations where this approach will lead to sub-optimization (i.e., it will violate the goal congruence criterion). These situations are illustrated below. The $19 per unit transfer price signals profit center b to buy inside since component 12 cannot be purchased any cheaper from outside companies. This decision will be in the best interests of profit center b, whose income will increase $1.70 per unit, but it will not be in the best interests of the company as a whole. If upper-level management forced an outside purchase (which if it did so would violate the autonomy criterion), the company as a whole would avoid losing $0.10 per unit. Since the outside purchase price is not less than the $19 per unit transfer price, profit center b will buy component 12 from profit center S. This decision benefits profit center b to the extent of $1.70 per unit but is disadvantageous to the company as a whole to the extent of $1 per unit. If upper-level management interferes in order to achieve goal congruence, there will be a violation of the autonomy criterion. The $20.80 per unit transfer price signals profit center b to buy the 20,000 units of component 12 from the Thompson Company at $19 per unit. This decision will be in the best interests of (1) profit center b whose income will increase, as it did in the original version of situation 1, by $1.70 per unit and (2) the company as a whole, which will now avoid losing the $0.10 per unit that would have been otherwise lost. All the other three criteria are satisfied as well, especially autonomy, since upper-level management will not have to intercede to avoid the $0.10 per unit disadvantage to the company as a whole. The $21.70 per unit transfer price sends a signal to profit center b to buy 20,000 units of component 12 from the Thompson Company at $19 per unit. This decision is beneficial to profit center b, as before, to the extent of $1.70 per unit. However, this time it is also beneficial to the company as a whole, which will not be disadvantaged to the extent of $ per unit. The motivation and performance evaluation criteria are satisfied as well as autonomy since there will be no need for upper-level management to force an internal transfer. A transfer price of $10.70 per unit goes all the way back to the very first illustration wherein the transfer price was set equal to variable cost. There the $10.70 per unit transfer price signaled profit center b to buy the 20,000 units of component 12 from profit center s as opposed to the Thompson Company at $19 per unit. Goal congruence results because both profit center b and the company as a whole benefit by $10 per unit if the internal transfer takes place. The synthetic market price, however, fails to satisfy the motivation and performance evaluation criteria for profit center S.
The evaluation of the synthetic market price has now been completed. In conclusion, the synthetic market price will always lead to goal congruence but may lead to motivation and performance evaluation problems for the selling profit center. The latter problem can be easily remedied through the judicious use of a dual transfer pricing system, described below. As has been shown, it is just not possible to have a single transfer price. The buying profit center and the selling profit center have different interests in the transfer price. In one case, the price is used to make a decision to buy and thereby determine the output of the purchasing profit center; and in the other case, the price is an important factor in evaluating the performance of the selling profit center. in a dual-price situation the buying profit center is charged the synthetic market price while the selling profit center is given credit for either standard variable or full cost plus a normal markup. The income for the company as a whole will be less than the total income for the profit centers. In preparing financial statements, intra-company eliminations would have to be made for these differences. Any amount transferred in excess of company costs would have to be eliminated. This dual transfer pricing system has not been in common use, because there is no single transfer pricing method that is capable of satisfying the four criteria in all situations. Only the dual transfer pricing system is capable of promoting goal congruence, motivation, autonomy, and performance evaluation under all conditions. A Multinational [International] transfer pricing topic with a comprehensive illustration will be discussed on the next post. If you enjoy the transfer pricing topic, you would not miss it. Related Topics:Comprehensive Illustrations of Transfer PricingComputation Of Synthetic MarketCost Plus Transfer Pricing MethodCost Transfer Pricing MethodDual Transfer Pricing SystemHow Important Is The Transfer Pricing Issue?Market Price MethodNegotiated Price MethodProfit CenterRelevant Income For Profit CenterRelevant IncomesResponsibility CenterSynthetic MarketTransfer PricingTransfer Pricing Case ExampleTransfer Pricing DatasTransfer Pricing DiagramTransfer Pricing For Profit CenterTransfer Pricing MethodsWhat is Transfer Pricing?